Oocyst Normal numbers of oocysts are produced. Mature (11-13 day) mutant oocysts have the same size as wild type oocysts. No sporozoites are formed within the oocysts. Oocysts appear vacuolated. Sporozoite Normal numbers of oocysts are produced. Mature (11-13 day) mutant oocysts have the same size as wild type oocysts. No sporozoites are formed within the oocysts. Oocysts appear vacuolated. 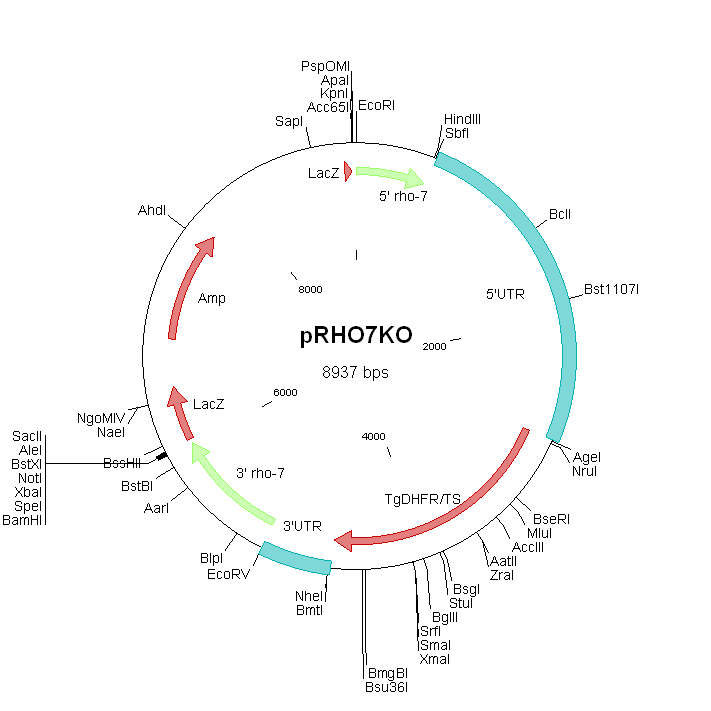 The mutant lacks expression of rhomboid protease ROM3. Rhomboid proteins are intra-membrane proteases that play a role in multiple processes. They belong to a family of serine proteases that cleave cell-surface proteins within their transmembrane domains. The Plasmodium genome encodes a total of 8 rhomboid proteases (ROM1, 3, 4, 6, 7, 8, 9 and 10). . The phenotype analyses indicate that ROM3 plays an essential role in oocyst development and in the formation of sporozoites. Sporozoite formation is completely blocked in the absence of ROM3. Transcripts of rom3 were not detected in asexual blood stage parasites. Relatively high transcription levels were observed in the gametocyte and ookinete stage. See also RMgm-763 for a P. berghei mutant expressing a (C-terminal) GFP-tagged version of rhomboid protease ROM3. ROM3-GFP expression was observed in female gametocytes and ookinetes while no GFP-signals were detected in developing oocysts.